I don’t know what this sandwich is. It’s sort of Greek and obviously American. It’s honestly just a concoction I threw together for a busy weeknight meal that turned out to be pretty tasty. Although I leave you with a recipe, I really just want to wish you a wonderful holiday. I hope you have a fun, food filled, full of celebration 4th of July. For me, the chaos and fun start today. Independence Day may just be my favorite holiday. I love the red, white, and blue everywhere I look. I love to watch our towns come together to celebrate, and get excited myself when I see how wound up the kids are. This makes me remember a funny story, one I remember each 4th of July. I was 23-years-old private several weeks into Army Basic Training. Our platoon was strict; obviously there was no alcohol, but we were also not allowed caffeine or sweets of any kind. Except on the evening of the Independence Day celebrations. Well, I went a bit nuts with the sodas and candy bars. OK, I all out gorged myself sick really. I inhaled Pepsi and Mountain Dew, as well as multiple giant sized candy bars and celebration cake. I was so hyped up on sugar and caffeine I jumped and ran around the field like an excited 6-year-old all evening. I can’t even imagine what I would have done if they'd offered beer! Anyway, I ended up with a massive stomach ache that night, and the next morning’s exercises were pure torture. I would do it all over again in a heartbeat though. It was so exciting to be a brand spanking new American soldier full of pride and feeling like I belonged to my country. I felt like I was finally a very tiny piece of its history in some small way. I’ll never forget that feeling, and it will be on my mind as I hang flags around town Saturday morning with the American Legion. Happy 4th of July my friend! 1. With a cheese grater or food processor grate the zucchini & onion and place in separate bowls. Set aside. 2. Add all the sauce ingredients in a food processor and process until smooth. Set aside. 4. In a large bowl, gently mix together the ground beef, ½ cup of the shredded zucchini, ½ teaspoons salt, garlic powder, onion powder, and feta cheese. Form into small patties and brush with olive oil. 5. Grill burgers until char marks form and are cooked through flipping once. Remove to a plate, leaving the grill on. 6. Throw the pitas on the grill for about 30 seconds per side until warmed through, flipping once. Move to a paper towel covered plate, and cover with another paper towel. 7. 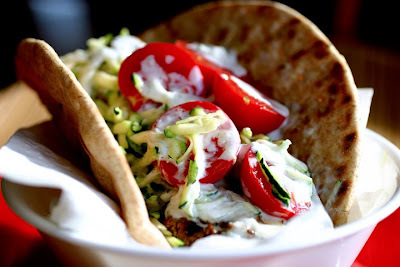 Assemble the pitas with burgers, tomato halves, grated zucchini, & zucchini yogurt sauce. Serve immediately. Ohhhhhh, this looks DELICIOUS!!!! I love the idea of something different than the same old, same old burger idea! Thanks for sharing (and beautiful pic as always)!!! Sounds like a new one I need to try! And happy Independence Day to you! Oh man... this photo is magazine cover worthy!!! Happy 4th to you my blogging baking buddy! The yogurt sauce in the pita w/ the tomatoes...Oy that sounds good..I bet even with chicken..Fresh! Yum! I can't wait to try this. Hi Laura I hope you have fun this weekend, I don't want you to spend the day just cooking and cooking! I love this picture, I just got my first photo shop sofware ever, now I just need a good camara and a few long distant lessons from you. I will make you a cake any time!! Such a cool and creative recipe! Looks delicious! I looooove mini burgers. Especially when they have this Mediterranean twist! Happy 4th ladies! Thanks for the comments. Ttys! Happy 4th of July Laura! You were in the Army! Wow, you must have great stories from those times! I love this fusion recipe, no need to decide where it comes from, because we know where's is going! yummy! This looks perfectly delicious. Have a wonderful holiday. Spending the day going through bookmarks. Just had to say, boy oh boy I sure would LOVE one of those mini burger pitas right now. They look heavenly! That looks like a great way to enjoy burgers. Love the twist to the typical 4th burger! Thanks for that zucchini sauce recipe too! Just found your blog and made these tonight. They were awesome!!! Thank you! I also ventured to make the pita from scratch and they turned out perfect. I did not cook them in an oven, but used a frying pan (like tortillas) and they were heavenly.